I usually abhor the concept of science by petition. But I have had a gutsful of devoted anti-fluoridationists assuring me that they have scientific and other experts on their side. And the last straw was the attempt by a local supporter of Fluoride Free Hamilton to get the Waikato University Chemistry Department staff to stop discussing the science of fluoridation. He wanted scientists to opt out of discussing science! So it was nice to see medical, scientific and technical people respond a little to this. The last issue of Hamilton’s free paper Hamilton News included a list of New Zealand experts who disagree with the anti-fluoridationist claims. The list was whipped up in short time and is not restricted to local people. “The following medical, scientific and technical experts deplore the misrepresentation of science to support the beliefs of the anti-fluoridation lobby. Download a sharper version if you wish to check names. Credit: Making Sense of Fluoride Facebook page. 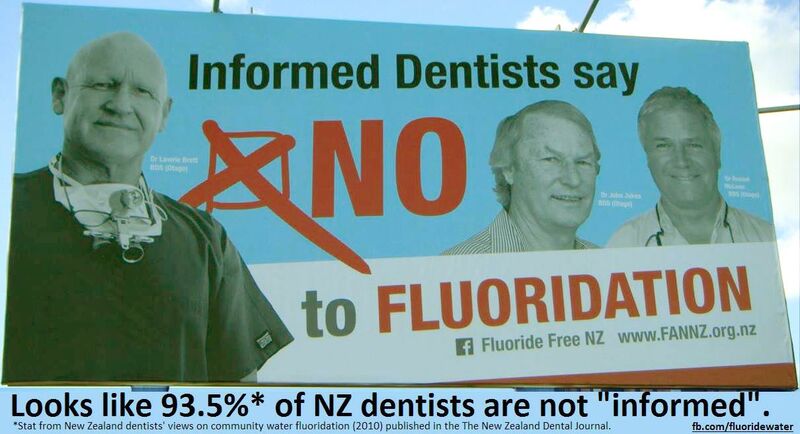 Looks like the Fluoride Free Hamilton activists have managed to find 3 dentists who they agree with. None of them work in Hamilton – one is from Northland, one from Wellington and the other is from Dunedin. So they literally searched far and wide to locate them. Never mind, Fluoride Free Hamilton and its network is trusted by the Hamilton City Council when it comes to health matters. So they can continue to ignore the advice from local and national health experts. However, it might be harder for the incoming council to ignore the advice coming from voters during the upcoming local body elections and fluoridation referendum in the city. The fluoridation issue is turning out like the controversy around scientific issues like climate change and biological evolution. Just as scientists supporting creationism or climate change denial turn out to be a very small fraction of the numbers on those fields, dentists opposing community water fluoridation are also a very small fraction of all dentists. Mind you – Fluoride Free Hamilton seems to be making a virtue out of that embarrassingly small support for their views. I am expecting to hear them come out with the Galileo Gambit some time soon. Thanks to Dan from Making Sense of Fluoride for bringing my attention to the paper.